I am continuing on with the remix challenge and carrying over one item from the day before. I like this challenge a lot as it makes it very easy to choose an outfit. I always have one piece as my jumping off point… A reminder of the previous day’s outfit…. Linking up with Visible Monday And Monday Bloom, so go take a look at other lovely ladies! Gratitude: I am grateful that I found the energy to run out for the photos as I am having sinus trouble and running a low fever.. I am grateful to my husband for taking today’s photos.. I am grateful to my husband for making a wonderful London broil dinner for us all Saturday when my fever was high and I was napping.. I am grateful for a phone call from my daughter away at college to share her snowfall with us through Skype. 19 Responses to "Rain,Rain Go Away…." I am so sorry you are feeling bad and hope you get better soon. I love the first outfit…skirt is so cute! Take care of yourself! 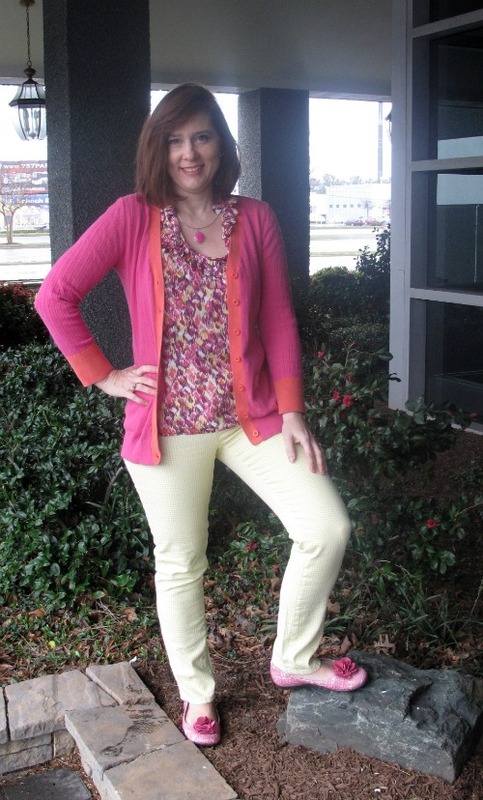 Yes, gotta love the yellow and pink color combo! I really like the last outfit; the colors are spring-y happy and cheerful. I found your blog on Patti’s visible Monday. Its a lovely blog. Thank you, I love wearing cheerful colors on rainy days.. Visiting from Visible Monday because I love that pink cardi and top. Then when I saw the other pictures, I was blown away by that trench coat – too pretty! Yes, I do buy multiples sometimes, usually a blue/green version and a red/pink version of the same thing. It’s so handy! Now I try to thrift, mostly, so i don’t end up with multiples so much, just lots of odd, fun things! Thank you so much for your comments. Buying at thrift stores is a great way to cut down on buying multiples. That trench is SO gorgeous!!! I love it! What a beautiful, cheerful combo of yellow and pink! I sometimes get multiples, but only when there are multiple colors I really love which rarely happens. Love that raincoat! Cheery colors. I do tend to purchase multiples of shoes and other timeless basics if they fit well. I love that bright jacket! We don’t have rain here, we have snow. I want it to go away too! As for buying multiples, I sometimes wish I had, but usually don’t. I love it, love it, love it! I would wear every single piece you have on, especially the raincoat. If I find something that fits well and is not likely to go out of style in the next five minutes I do buy multiples. I love that umbrella. I’m always on the lookout for fun rainwear, living in Vancouver. The rain coat, the pants, the shoes, love it all. GreatI love the pink flats. concept you’ve got here.Agreat way to make good use of what you have.